First and foremost, the survey shows that 37 percent of software installed on PCs worldwide is still unlicensed. While this is a two-point drop over the last two years, the alarming fact is that the majority of all countries surveyed still reflect unlicensed usage rates of over 50 percent. Here is a look at the survey’s key findings. Use of unlicensed software, while down slightly, is still widespread. Our data at Smartflow indicates the problem is getting worse rather than better, mainly because China is an increasingly large percentage of the total software market. We rely on the actual empirical usage statistics, while the BSA results are based on surveys. Chief Information Officers are finding unlicensed software is increasingly risky and expensive. Companies that install unlicensed software or buy computers pre-loaded with unlicensed software now have a one-in-three chance of infecting their systems with malware. The survey shows that each malware attack can cost a company an average of $2.4 million and take up to 50 days to resolve, elevating the use of unlicensed software from a minor infraction not worth dealing with to a major problem with serious consequences. Because malware infections result in system downtime and lost business data, a company’s brand and reputation can be affected as well. The survey shows that avoiding the security threats from malware is now the number one reason CIOs cite for ensuring the software on their systems is fully licensed. Improving software compliance is now an economic enabler and security imperative. 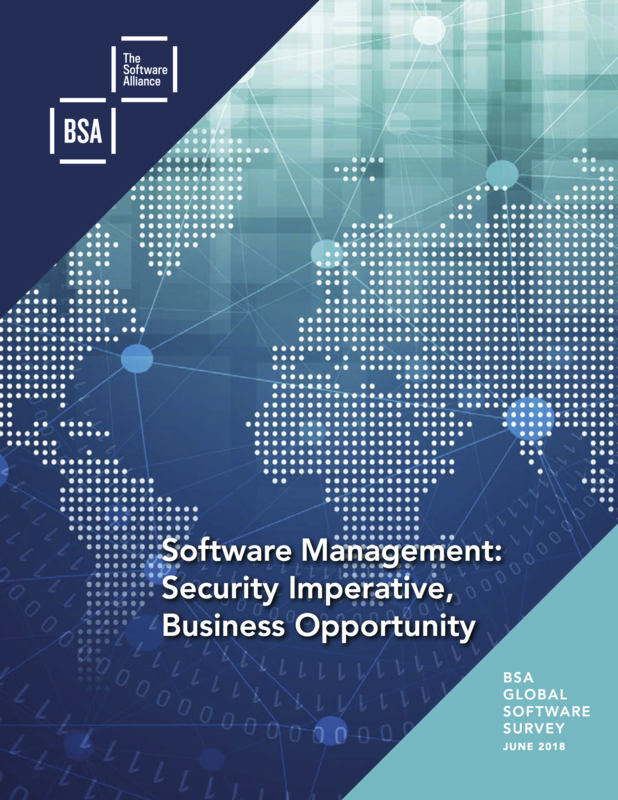 As the security and financial risks for knowingly or unknowingly using unlicensed software grow, business leaders are more fully understanding the benefits of ensuring their organizations are using fully licensed software that can be patched with the latest updates to defend against malware attacks, data breaches, and other security risks. They are also seeing that improving the management of software across the organization is a powerful tool in decreasing downtime and boosting the bottom line. IDC estimates that companies who proactively work to install/improve their compliance programs not only save the millions of dollars of downtime caused by malware attacks, they can actually increase the bottom line by as much as 11 percent. Organizations can now take meaningful steps to improve software management and achieve important gains. Companies that implement software compliance management programs and best practices can get much more out of their technology. Compliance management that ensures the software running on company systems is legitimate and fully licensed not only decreases cyber risks, it also improves productivity, reduces downtime, centralizes license management, and reduces costs. Studies show that as much as a 30 percent savings in annual software costs can be achieved by implementing a robust compliance program. As cyber-attacks, hacking, and malware continue to grow and threaten organizations, CIOs and company executives are increasingly leveraging the benefits of a software license compliance management program. SmartFlow offers comprehensive, cost-efficient solutions to meet the needs of every size company, from small startups operating within the U.S. to global conglomerates managing thousands of installations in hundreds of countries. Find out if your company has been hacked by requesting our free software piracy report. Learn more about SmartFlow solutions at smartflowcompliance.com/products.